Looks like you have been placing too much emphasis on someone else’s emotional needs. During the first week of the month, you will be confused and indecisive about the direction a relationship is taking. Don’t bottle up your feelings. This is a good time to confide in a close friend and talk things out about your relationship. However, do not depend on anyone’s advice to make decisions. Listen to your inner self. Take some time out for yourself and create a balance within. This card reversed indicates an inner discontentment because something is lacking in your life. You might be feeling low during the first week of June. 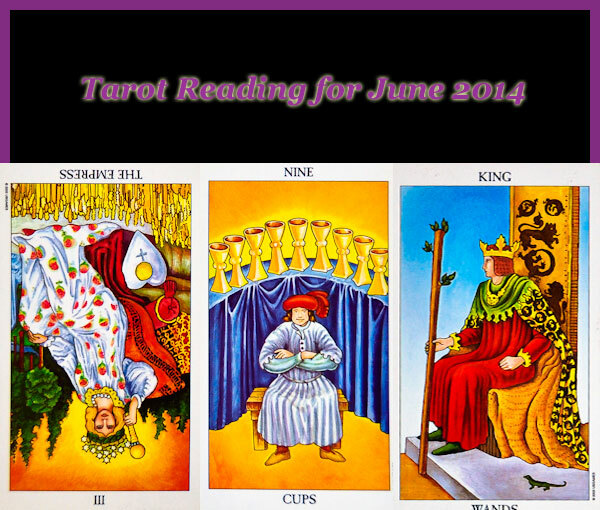 This card indicates that you will begin to feel more positive towards mid June. Generally, Nine of Cups brings happiness and this card is also referred to as the ‘Wish card’ because it signifies the fulfillment of your heart’s wishes. Joy and happiness are within your grasp and you must see the abundance that surrounds you. Make it a point to feel grateful and live in the present. By mid June, your worries will be behind you and you can look forward to a bright future. This card represents a natural born leader and visionary. By the end of June, set some goals and they will fructify with the support of the people around you. All the challenges you have been facing will only pave the way for a brighter future and stronger you. An opportunity might present itself to you and you will be in the right frame of mind to accept it. Go forth with clarity and confidence.